Provide comfort for the family of Betty Lou Fairweather with a meaningful gesture of sympathy. Betty Lou Fairweather of Auburndale, peacefully passed surrounded by her family in her 88th year on March 16, 2019. Survived by her beloved husband and best friend of many years, Howie Fairweather. Loving mother of the Late Robert (Kathy) Fairweather of North Carolina, Kathleen Ann (Paul) Hunt, Maureen "Moe Moe" Chiappa, Michael, Alan, and Dottie Golledge. Devoted grandmother of Micah, Erica, Jeffrey, Adam, Marisa and Heather. Also survived by her 8 great-grandchildren who she greatly adored, and all of her many dear friends. She was also a cherished 'second mom' to so many. After working at the Village bank for many years, Betty loved to travel to visit her family in NC and Bermuda when she wasn't spending weekends on the Cape. 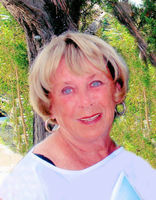 To plant a memorial tree in honor of Betty Lou Fairweather, please visit our Heartfelt Sympathies Store. We encourage you to share your most beloved memories of Betty Lou here, so that the family and other loved ones can always see it. You can upload cherished photographs, or share your favorite stories, and can even comment on those shared by others.